Patch Tuesday, patch any day, patch every day – but, please, patch automatically! 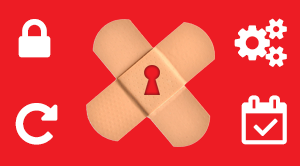 Patching is critical in defending your customers against vulnerabilities in everyday applications. It can now be automated from within security software, making it easier than ever to manage. Think of all those vulnerable third-party applications your customers’ businesses basically run on. Can you rely on your humans to keep their patches up to date? According to those involved in the recent Equifax debacle, for example, no! Break the human protocol, and the whole patching process falls apart. That’s terrifying when it’s been estimated that, overall, software exploits that target unpatched vulnerabilities account for 85% of all attack angles! So, automating the patching process seems like a great idea, taking the cost, effort, disjointedness and sheer human fallibility out of keeping users protected against one of the most insidious forms of cyber-attack. And, indeed, system management software (like the RMM solutions explored in this post) have arguably been doing this for a long time. But wouldn’t it be neater, easier - and even cheaper – if this automated patching capability were simply built into the security software itself, rather than relying on an extraneous monitoring system? After all, we’re constantly being told patching is security! Well, two vendors have listened. Slowcoaching – As the Equifax issue shows, being slow off the mark to patch a vulnerability sharply increases the likelihood of falling victim to it, but timeliness is a difficult thing to sustain when workloads are heavy. Proliferation – By definition, the applications requiring patching tend to be big-name office and productivity solutions, so they are not only highly ubiquitous but also available in many different versions (including legacy products). Managing these kind of complex patching scenarios manually can create a massive drain on resources or – worse – a helpdesk meltdown! Patch provenance – Obtaining patches from third-party websites is widespread practice, but does anybody seriously check the hashing of the patch with the hashing on the vendor’s website to make sure they’re downloading exactly what they think they are? Hmmm. Cost – Every manual process involved in managing or deploying a patch burns through expensive admin and management minutes. Manual patching, though critical, eats readily into margins. Now let’s consider the alternative. Between them, what Heimdal and Bitdefender have done is to turn pesky patching (reactive, unpredictable, requiring extraordinary resource) into everyday ‘business as usual’ practice.– simply by automating it. At a stroke, they have shifted third-party application security into the security layer (where it rightfully belongs), but in a way that it is easy (dare we say profitable?) to manage. Automatic patching of apps including Microsoft, Acrobat, Java, Flash and many more, with zero setup - and scheduling also possible. Non-disruptive operation – The update process happens ‘silently’ in the background whilst users carry on their work; Bitdefender also makes clever use of cacheing to maximise bandwidth and optimise performance. Needless to say, none of this requires the additional cost of an RMM solution, either, but the financial benefits don’t stop there. The Heimdal solution, for example, is available with monthly aggregated billing, so upfront costs are zero and average margin rises with every additional seat. Human error: a thing of the patching past? It’s tempting to see a miracle cure-all in solutions of this kind, but it pays to be appropriately cautious about their market viability. Security partners can rely on their own product testing, of course – and they certainly should invest time and effort in this. But the reality is that a security distributor with extensive experience of evaluating hundreds of solutions for sale using their own in-house technical experts is probably a more reliable source for determining the next rising star or the next puff of vapourware. We like what we see. You should take a look too. Posted in Bitdefender, Heimdal Security, Patching, RMM, Security. Tags: Security on 23/01/2018 by Mark Charleton.